Review a brief introduction to chromatin and the ChIP protocol, including highlights of relevant publications where ChIP, ChIP-on-chip and ChIP-seq have been used to map genomic regions and histone modifications. David Grotsky currently works as an Epigenetics Specialist at Abcam. He received his PhD in Molecular Genetics and Genomics from Washington University in St. Louis. His PhD thesis focused on studying the regulation of DNA repair factors and how they impact genomic stability and proliferation in tumor cells. Welcome to Abcam’s webinar on Applications of ChIP. Today’s principle speaker is David Grotsky. David received his PhD in Molecular Genetics and Genomics from Washington University in St. Louis. His PhD thesis focused on studying the regulation of DNA repair factors and how they impact genomic stability and proliferation in tumor cells. David currently works as an Epigenetics Specialist in Scientific Support at Abcam. Joining David today will be Ken Hamill, Category Manager for primary antibodies at Abcam. Ken has been with the company for 7 years. He did his graduate work in Biochemistry at MIT and subsequently received his MBA from Boston University. I will now hand over to David who will start this webinar. DG: Thanks Vicky and thank you all very much for joining me for this webinar. I’d like to start by just giving an overview of what I’ll be discussing in this webinar. I’ll start with an introduction to chromatin structure and modifications, followed by a brief overview of the basic ChIP protocol. Next I’ll briefly introduce the histone code hypothesis that was first presented in 2000, then I’ll go over what data from ChIP-qPCR looks like, and then review some interesting publications that used ChIP-on-chip to analyze chromatin modifications and genome organization. I’ll then discuss some publications where ChIP-seq has been used and finish by explaining some recently developed methods that use variations of the ChIP protocol. So, what is chromatin? Well in the human genome there are around 3.2 billion DNA base pairs which if unraveled would stretch to around 5 feet of DNA in every cell. To remedy this, DNA is tightly compacted into a higher order structure called chromatin so that the DNA can fit inside a cell’s nucleus. Chromatin, as we’ll soon learn, is also an important factor in controlling gene expression. The most basic unit of chromatin is the nucleosome, which consists of DNA wound around a core of eight histone proteins. The nucleosome core consists of approximately 147 base pairs of DNA wrapped around the histone octamer consisting of 2 copies each of histone H2A, H2B, H3, and H4. Histone H1 sits on top of this structure to keep the wrapped DNA in place. This ‘beads-on-a string’ structure is called euchromatin. When multiple nucleosomes condense even further to wrap into the 30 nm fiber this structure is termed heterochromatin. Finally, there is even higher level packaging to form metaphase chromosomes during mitosis and meiosis. The histones I mentioned earlier can undergo many post-translational modifications that affect how they interact with DNA, some of which are shown here. Histones H3 and H4 are the most commonly modified histones and have long N terminal tails protruding from the nucleosome whose residues are targeted for acetylation, methylation, phosphorylation, deamination, and ubiquitylation. There are also modifications to histone variants such as phosphorylation of histone H2AX at serine 139 that serves as a marker for DNA damage. Specific modifications have different effects on gene transcription, as we’ll see later. In order to determine which histone modifications, as well as where other DNA-protein interactions such as transcription factor binding are present at certain regions of the genome, chromatin immunoprecipitaion, or ChIP, was developed. In ChIP, DNA is cross-linked to proteins using formaldehyde and the DNA is then fragmented by sonication into fragments of 200-1000 base pairs. In some instances when the binding of protein to DNA is stronger, such as with nucleosomes, cross linking is not necessary, which is referred to as native ChIP. In native ChIP micrococcal nuclease is used to digest the DNA which produces DNA fragments at the size of a monosome. Next, a specific antibody of interest is added to bind to the protein-DNA complex which is then immunoprecipitated, pulling down only DNA fragments that are directly bound to the target protein. After several rounds of washes, cross-links are reversed if applicable, protein and RNA are degraded, and the DNA can be purified for later analysis. The abundance of DNA pulled down can be determined compared to the input, or the starting chromatin amount. Now that we’re familiar with ChIP, I’d like present an early ChIP experiment from 1988 that was one of the first studies to identify a link between histone acetylation and transcriptional activation. Here the authors developed and categorized an antibody raised in rabbits that was specific for acetylated histone H4. Chromatin was isolated from erythrocytes of 15 day old chicken embyros and was treated with micrococcal nuclease to fragment the DNA. After incubation with the antibody the immunoprecipitation was carried out using formalin fixed staphylococcus aureus cells that had active protein A in the outer membrane, so this was before there were protein A or protein G beads. They then dot blotted the DNA and performed a southern blot for alpha D globin with chromatin from 3 stages of the experiment. Alpha D globin is actively transcribed in these cells. The authors found a very high alpha D globin signal in the bound fraction which contained the antibody for acetylated histone H4 as you can see in column 5, demonstrating the presence of acetylated histone H4 at a very active locus. You can also see that the input, unbound fraction, and fractions that contained no antibody did not produce alpha D globin signal. So in the first part of this figure that I just showed, the authors showed that acetylated histone H4 is present at the active alpha D globin locus. They compared these results to the inactive ovalbumin locus. As you can see in column 5 again, there is no ovalbumin signal in the bound fraction compared to the input, indicating that acetylated histone h4 is not present at ovalbumin. Overall these results demonstrate that a gene undergoing active transcription contains a significant level of acetylated histone H4 while an inactive gene does not. This study that I presented, as well as many others that began to show that different histone modifications were specifically correlated with transcriptional activation and repression, led scientists to wonder if these modifications served a higher role in genome structure and function. So here I just want to touch on an idea from 2000 first written about by Brian Strahl and David Allis, the histone code hypothesis. This hypothesis presents the idea that specific histone modifications would serve to recruit other proteins to alter chromatin structure or affect transcription. In this image they present common histone modifications with the known functions at the time, as well as any known associated or interacting proteins. It turns out that the histone code as originally presented is highly complex with many possible combinations of modifications affecting protein recruitment and transcriptional regulation. Scientists have made huge strides in identifying the functions of many histone post translational modifications, and the histone code hypothesis is still being intensely investigated and debated. With the influx of new technologies we’ve been able to use ChIP to further investigate the role of histone modifications and other DNA binding proteins, as well as the organization of the entire genome. 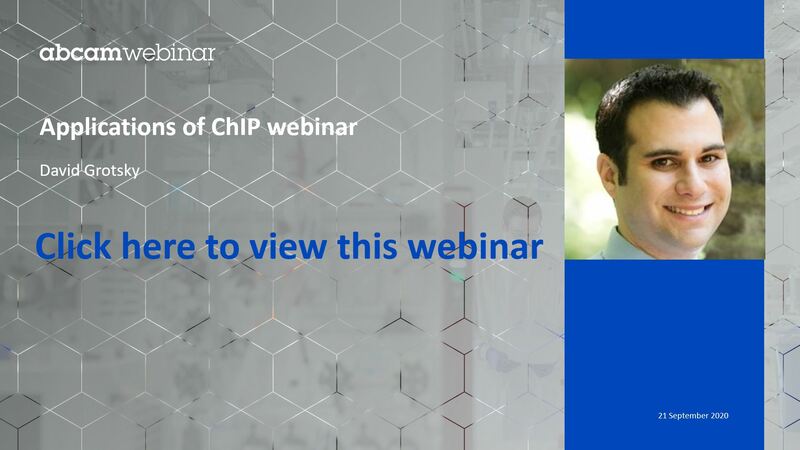 The most common methods to analyze ChIP data include ChIP followed by quantitative PCR, ChIP followed by hybridization to a DNA microarray, and ChIP followed by next generation sequencing. I’d just like to briefly give an example of results from ChIP obtained from qPCR. Here I’m presenting data for one of our antibodies that was tested in our lab, histone H4 that is acetylated at lysine 8. After pulling down the DNA that was bound to the acetylated histone H4 we performed qPCR with primers to amplify 3 genes that are transcriptionally active, that you can see on the left, and 3 genes that are transcriptionally inactive, that you can see on the right. Acetylation of H4K8 is associated with gene activation, so as you can see, the 3 active genes had greater enrichment relative to input of the acetylated histone than the inactive genes had. While ChIP followed by qPCR is now the most common way to analyze ChIP experiments, you are constrained in that you need to have a specific locus in mind that you want to PCR for. We’re able to perform ChIP analysis genome-wide using ChIP-on-chip, which is diagrammed here. With ChIP-on-chip for instance, you can determine across the entire genome where trimethylation of lysine 4 of histone h3 is present or absent using microarray technology. In ChIP-on-chip, the ChIP procedure is carried out as it normally would be until after the DNA is purified. At this point, the immunoprecipitated DNA is amplified and labeled fluorescently. The input DNA is also amplified and labeled with a complementary fluorescent probe and both sets of labeled DNA are combined and hybridized to microarrays corresponding to specific domains, loci of interest, or even the whole genome. The ratio of signal from the fluorescent labels of the ChIP’d DNA and control DNA allows enriched regions to be identified. Here’s an example of a very early ChIP-on-chip experiment. The authors set out to analyze acetylation and methylation patterns in saccharomyces cerevisiae genome-wide. They performed chromatin immunoprecipitation with antibodies targeting acetylated histone H3 and H4 as well as dimethylation of histone H3 at lysine 4. The microarrays used in this study were for open reading frames for the coding regions, or for intergenic regions that contain the gene promoters. This figure shows that global H3 and H4 acetylation is highest in promoter regions but is also high in coding regions, while dimethylation of histone H3 at lysine 4 is not present at promoters but is high in coding regions. Since this was an early ChIP on chip experiment, they validated their results using conventional ChIP, which is good practice in general. They performed ChIP using antibodies targeting SUB2, MNN9, and YHM2 which are all actively transcribed genes, and in panel A you can see that for histone H3 acetylation at SUB 2, the promoter region is more enriched than the coding region, and for lysine 4 methylation there is much more enrichment at the coding region than the promoter region. The case is the same at MNN9 and YHM2 in panel B, confirming the results found in the ChIP-on-chip experiment. Several years later ChIP-on-chip evolved a bit more to produce results with greater specificity and higher resolution. In this publication the authors used ChIP-on-chip studies to identify active promoters in the human genome. They mapped RNA polymerase 2 preinitiation complex binding sites, which consists of RNA polymerase 2, transcription factor 2D and other general transcription factors. They ChIP’d for TFIID bound DNA using an antibody that recognizes the TAF1 subunit of this complex, followed by hybridization to microarrays representing all non-repeat DNA throughout the human genome and found 12,150 TFIID binding sites. You can see an example of the data in panel B where the large peaks correspond to the transcription start sites of genes, and then there is a close up view of the TAF1 ChIP data showing the peaks at the TCFL1 promoter. The investigators matched the ChIP’d TFIID binding sites to 5 prime ends of known transcripts and found that 83% were found within 500 base pairs of the transcription start site as shown in panel C. These 9,328 DNA sequences were defined as promoters. These promoters matched with 8,960 ensemble genes and 5,118 known promoters, in panels D and E respectively. After further analysis, the authors defined 1,239 possible promoters that did not correspond to known transcription units. A majority of these putative promoters were significantly enriched for known promoter sequences such as CpG islands, initiator elements, and downstream promoter elements, as shown in panel F.
Interestingly, this study also showed that many genes contained two or more active promoters. In this figure the authors looked at the WEE1 gene in depth and you can see there are 2 TFIID binding sites. Each promoter corresponds to the 5 prime ends of 2 distinct mRNA transcripts, the first encodes the full length version of WEE1, while the other only encodes the kinase domain. Both transcripts were detected in an asynchronous population of IMR90 cells, in panel B, and in cell cycle synchronized populations of these cells, in panel C, the shorter transcript is more abundant in G0 cells, while the longer transcript is most common in G0 and S phase. These results suggest that the two promoters of the WEE1 gene could have distinct cell cycle functions. In another very interesting study, ChIP-on-chip was used to map histone modifications of promoters. In this paper the investigators performed ChIP-on-chip analysis along a 30 megabase stretch of the human genome to investigate the chromatin signature at promoters and enhancers. They looked at core histone H3 and five histone modifications: acetylated histone H3, acetylated histone H4, and mono, di, and trimethylated histone H3 at lysine 4. They also ChIP’d for RNA polymerase II and TAF1, which as I mentioned earlier is the largest subunit of the TFIID transcription factor, to identify active promoters and ChIP’d for p300 to identify active enhancers. Panel A shows the heat map where red is enriched for the modification and panel B shows the quantification of the heat maps for four classes of genes based on transcriptional activity from P1 which is low transcription, to P4 which is high transcription. The authors found a bimodal distribution centered around the peak where RNA polymerase 2 and TAF1 bind to the transcription start site. This indicates that the transcription factor binding site is devoid of nucleosomes, as confirmed by the histone H3 ChIP-on-chip data. Furthermore, you can see the transition of histone H3 lysine 4 trimethylation to dimethylation to monomethylation the further from the transcription start site you go, with a bias towards the region immediately downstream of the start site, especially for trimethylated H3K4. There is also enrichment of acetylated histone H3 and histone H4. To investigate the chromatin signatures at enhancers, the authors looked at 10 kilobase regions that were surrounding DNA enriched for p300 binding. P300 is an acetyltransferase that is commonly present at enhancers. From the data we see that at enhancers there is a lack of histone H3 binding indicating a lack of nucleosomes, similarly to what was seen at promoters. Monomethylated H3K4 was strongly enriched at all enhancers whereas there is a lack of trimethylated H3K4, which is a big difference from what was seen at promoters. Acetylated H4, acetylated H3 and dimethylated H3K4 were found in varying degrees and RNA polymerase 2 and TAF1 are present to lower extents in some enhancers. The authors then used these chromatin signatures they found at promoters and enhancers to predict the locations of these elements in the genome with high accuracy. There are some limitations of ChIP-on-chip, though as technology advances these are becoming less of an issue. The first is the large number of cells that are required for ChIP-on-chip experiments. ChIP-on-chip is also not sensitive to all of the repetitive elements in the human genome. Another problem is that a large number of arrays are necessary to cover the entire genome, and finally ChIP-on-chip could be susceptible to amplification bias after DNA amplification. Then in 2007, ChIP followed by next generation sequencing, or ChIP-seq, emerged as a very powerful tool for genome wide chip analysis. Here is a flow chart of the ChIP sequencing procedure from the publication that first described the technique. The authors performed native ChIP with micrococcal nuclease digestions of chromatin, and I have to add here that most of the antibodies used in this study were from Abcam. After the DNA was collected following the immunoprecipitation, an adaptor was added to the DNA ends, followed by limited PCR amplification and clustering, which was followed by next generation sequencing. The short sequences generated could then be mapped to the genome. The biggest difference and the best improvement of ChIP-seq compared to ChIP-on-chip is the base pair resolution that was not possible with ChIP-on-chip. ChIP-seq also avoids many of the limitations of ChIP-on-chip that I discussed previously. In this figure we’re looking at the binding profiles of the chromodomain protein Chromator in Drosophila melanogaster cells. You can clearly see the wider peaks of the ChIP-on-chip data in the upper blue panel compared to the much higher base pair resolution in the thinner peaks of the ChIP-seq data in the red profile. If we go back to the 2007 ChIP-seq paper we can see the high resolution map of histone modifications. The authors correlated binding of histone modifications and several other proteins, such as RNA polymerase II that you can see here, to genes in resting human CD4 positive T cells whose expression levels are known. They grouped genes based on expression levels into either high, medium, low or silent genes, as indicated by the different colors, and they were aligned relative to the transcription start site. The data is pretty much the same as what was found by ChIP-on-chip, with the nucleosome free region directly at the transcription start site, the bimodal distribution of the modifications surrounding the start site, and the bias of histone modifications towards the 5 prime end of the start site. Again we see the transition of trimethylated to dimethylated to monomethylated H3K4 the further you get from the transcription start site. H3K27 trimethylation was higher at inactive promoters as expected in panel E, but a bit surprisingly monomethylated H3K27 was present at active promoters in panel F.
In this figure the authors correlated histone modifications with expression levels. They separated genes into groups of 100 genes based on expression levels, which can be seen by the black dotted line going from higher expression to lower expression, from left to right. Then each histone modification tag density was plotted relative to those expression levels. In panel A you can see that all modifications of H3K4 are correlated with gene activation, as levels of these modifications decrease as expression decreases. H3K27 di and trimethylation is associated with repression, whereas monomethylation is associated with activation. H3K36 trimethylation is also correlated with activation, and trimethylation of H3K79 is correlated with repression, which was somewhat unexpected since this modification is associated with activation in yeast. From the data I’ve presented so far and all of the other evidence gathered about histone modifications, this dashboard of histone modifications was put together. There are specific modifications at promoters of inactive, poised, and active genes; within gene bodies, at enhancers, and modifications that are marks of large scale repression. H3K4 modifications and acetylation are common in active promoters and enhancers, while H3K9 di and trimethylation are common at inactive genes. There are also other genomic features that are marks of large scale repression that can be measured by ChIP such as DNA methylation, lamina associated domains, polycomb bodies, and LOCKs or large organized chromatin K modifications. Here is another way that I think really neatly presents these histone modifications along an active gene. Histone modifiers interact with RNA polymerase 2 which introduce activating histone modifications as the polymerase travels along the DNA. We see again the very well defined promoter region with the nucleosome depleted region and H3K4 modifications and acetylation. Clearly you can see that with all of the ChIP-on-chip and ChIP-seq data, we have a large amount of information about what’s happening with histone modifications at different parts of the genome. A large project, called the encode project, which stands for the encyclopedia of DNA elements, has been ongoing with collaboration between several research groups and the National Human Genome Research Institute. The goal of this project is to build a comprehensive list of functional elements in the human genome. You can browse through the data at the UCSC genome browser. Here we’re looking at a stretch of chromosome 21, and at the top you can see the genes that are present at this location, with the introns and exons indicated, as well as SNPs, transcription levels determined by RNA seq, acetylated H3K27 levels, DNAse 1 hypersensitivity sites, transcription factor ChIP data, as well as much more. You can choose what information you want to and don’t want to see. Part of the Encode project was to create ChIP-seq guidelines to standardize all of these types of experiments. They recommend rigorous primary antibody characterization before use in ChIP-seq. Sequencing depth is also important; the consortium recommends a minimum of 20 million reads. Experimental reproducibility is obviously important; they recommend at least 2 experiments to ensure reproducibility. They also have quality control guidelines, where cross correlational analysis is recommended for assessing signal to noise ratio in ChIP-seq experiments. Finally they recommend guidelines for reporting ChIP-seq data to ensure data sharing among all laboratories. They say all ChIP-seq data should be submitted to public repositories. So far, I’ve talked about ChIP qPCR, ChIP-on-chip, and ChIP-seq and what data from those ChIP readouts look like. Now I’d like to wrap up by briefly introducing some variations of ChIP that have been emerging recently. A major problem with ChIP since the application was first introduced has been that you need a large number of starting cells and a lot of chromatin for each pulldown, but now there are kits and protocols that allow you to perform ChIP with low cell numbers. Another problem with ChIP was that each experiment took several days from start to finish, now there are kits that allow you to perform ChIP in under 5 hr. ChIP-loop is a combination of ChIP and chromatin conformation capture, more commonly known as 3C. 3C is used to identify long range DNA interactions, and with ChIP-loop you’re looking for these interactions that are mediated by a specific protein of interest. Cells are cross-linked and DNA is restriction digested, then the chromatin is immunoprecipitated using an antibody. The DNA fragments are ligated and the cross-links are reversed followed by DNA purification. The interactions can then be detected by qPCR. ChIA-PET stands for chromatin interaction analysis by paired end tag sequencing. This is essentially genome-wide ChIP-loop. During the ligation step linker sequences are added to the DNA ends to create a library of interacting regions which can then be sequenced using next generation sequencing. ChIP-exo is able to detect protein binding at single nucleotide resolution by removing any DNA not bound directly to the protein. After the immunoprecipitation, PCR adapters are added to the DNA and the 5 prime tails of DNA protruding from the protein-DNA complexes are digested with a 5 prime to 3 prime exonuclease. The cross-links are then reversed and the DNA is amplified using primers to the first adapter. A second adapter is added to the 5 prime ends and the product is sequenced. Everything sequenced between the adapters are the exact binding sites of the protein of interest. Finally there’s ChIP-BS-seq which is ChIP followed by bisulfite sequencing to look at DNA methylation at regions that have a specific histone modification or chromatin binding protein of interest. After the ChIP is performed, DNA is bisulfite treated and sequenced. So as you can see, there are some exciting new methods that build upon ChIP to make it an even more powerful tool for scientists to study DNA-protein interactions. I’d like to thank everyone for joining me for this webinar, I hope this was interesting and informative for everyone. I’d now like to turn the webinar over to Ken who will tell you about some great Abcam epigenetics products. After Ken is done I’ll be back to answer some of your questions. KH: Thank you David for such a clear presentation. I’m sure you will have plenty of interesting questions from our listeners. I’d now like to spend a few minutes presenting some of the exciting ChIP products that Abcam has available for researchers, and highlight technical resources and upcoming conferences that will hopefully be of interest. There are some key advantages to using Abcam’s ChIP kits instead of following the conventional ChIP method. First, the reaction takes place on a 96 well plate so it’s easy to standardize, and is well suited for high throughput applications. It only takes 5 hr to perform your experiment. The kits contain all necessary reagents (except for the cross-linking reagents) and the precipitated DNA can be used straight away for downstream processes such as ChIP-on-ChIP or ChIP-seq, techniques just discussed by David. Our new High Sensitivity ChIP has been specifically optimized for use when there is a limited amount of sample available to perform ChIP. For example, when working with patient material, transgenic mice tissues or stem cells. With the High Sensitivity ChIP kit, you can obtain enrichment of your sequence of interest by using as little as 2000 cells or 0.5 mg of tissue per reaction. Moreover, you can get your results in only 5 hr, so the experiment can be done in one working day. We also offer methylated DNA immunoprecipitation kits. These kits contain highly specific antibodies to enrich both methylated and hydroxymethylated DNA. These modifications are implicated in differential gene expression, and therefore it is important to have the proper tools to investigate their function. Our immunoprecipitation kits also complement other common DNA methylation experiments, such as bisulfite modification, where it is not possible to differentiate between methylated and hydroxymethylated cytosine. And finally, remember that the input determines the output, so a successful ChIP experiment begins with good starting material. Abcam’s Chromatin Extraction Kit has been specially designed to prepare chromatin for further use in ChIP experiments. In less than 1 hr, the chromatin from your cells or tissue is ready to be ChIP’d. If you would like to learn more or refresh your knowledge on different types of techniques and applications, watch our archived webinars at any time that suits you with our online Webinar Library. It can be found at www.abcam.com/webinars. Finally, I would like to take this opportunity to highlight two upcoming Abcam conferences which might be of interest to you. Firstly we have this free meeting on the Functions of Non-Coding RNAs in Evolution, Epigenetics and Therapeutic Applications. This meeting will take place at the Genome Institute of Singapore on 15th January, 2015. If you would like to join us and present your work, we’re currently inviting abstracts for presentations. For more information about the meeting and how to register, please visit the event website at www.abcam.com/singapore2015. Second, is the Frontiers of Cell Signaling conference which will be taking place in Shanghai on 21st -24th of June, 2015. Talks and poster presentation places are available and abstracts can be submitted during online registration. Visit www.abcam.com/cellsignaling2015 for more information. And without further delay, I’ll pass you over to David who is ready to answer the questions we have received during the webinar. DG: Thanks Ken. I’ll now answer some of the questions from the attendees that were asked during the presentation. One here is: What are the main differences as well as advantages and disadvantages between cross-linking ChIP and native ChIP? Well, generally cross-linking ChIP is recommended for protein-DNA interactions that are not very strong, such as when you’re looking at transcription factors or larger protein complexes that are bound to DNA. For this formaldehyde is recommended for cross-linking, as the cross-links formed with formaldehyde are reversible. Chromatin is fragmented by sonication to random sizes of 200 to 1000 base pairs per fragment. The major disadvantages to cross-linking ChIP is that the epitope an antibody binds to might become masked, due to the cross-linking, and a wide range of chromatin fragment sizes are produced due to sonication. Native ChIP can be used when the protein-DNA interaction is strong, such as when looking at histones and histone modifications. In native ChIP, microccocal nuclease is used to digest chromatin producing fragments the size of monosomes, which are around 175 base pairs. This is the highest resolution possible in a standard ChIP experiment. There is also no masking of epitopes that could be hidden as with cross-linking. Disadvantages of native ChIP are that it is not suitable for non-histone proteins, and that the nucleosomes may rearrange during digestions. Another question we have: What are good controls for ChIP experiments? In terms of antibody controls, for a positive control for an active gene you can use an anti-histone H3 lysine 4 trimethyl antibody and for a positive control for an inactive gene you can use an anti-histone H3 lysine 9 trimethyl antibody. A general histone antibody, such as an anti-histone H3, could also be a good positive control and is also important for normalizing histone modifications to histone content. For your negative control you could use beads only with no antibody added, a relevant IgG isotype control, or an antibody targeting a non-chromatin target such as anti GFP. For PCR controls, you should include a no template control that contains no DNA, as well as control primers for where you know your protein of interest should bind, and primers for where you know your protein of interest shouldn’t bind. Now it looks like we only have one more question, and that question is: How should antibodies be validated before ChIP-seq? Well, the ENCODE consortium made guidelines, that I spoke of earlier for antibody validation. The first step, they say, is to test the antibody by western blot or by immunofluorescence. Next they recommend testing the antibody in one of the following 4 methods: testing the antibody in cells in which the target protein is knocked down or knocked out, immunprecipitation followed by mass spec verification, immunoprecipitation with multiple antibodies against different parts of the target protein, or immunoprecipitation with an epitope tagged version of the protein. Then the antibody can be tested for ChIP and then for ChIP-seq. There are also databases online that show which antibodies have been fully tested for ChIP seq. Right, thank you David and Ken for your presentations. If you have any questions about what has been discussed in this webinar, or have any technical enquiries, our Scientific Support Team will be very happy to help you. They can be contacted at technical@abcam.com. We hope you have found this webinar informative. We look forward to welcoming you to another webinar in the future.